As I mentioned in my last post, my son recently had a pirate treasure hunt at preschool. This weekend we had about an hour without interruptions for the two of us to have what he calls "learning time." He really wanted our day to be pirate themed (because of last week's party)... so I came up with a few easy pirate projects that I'll share today and tomorrow. 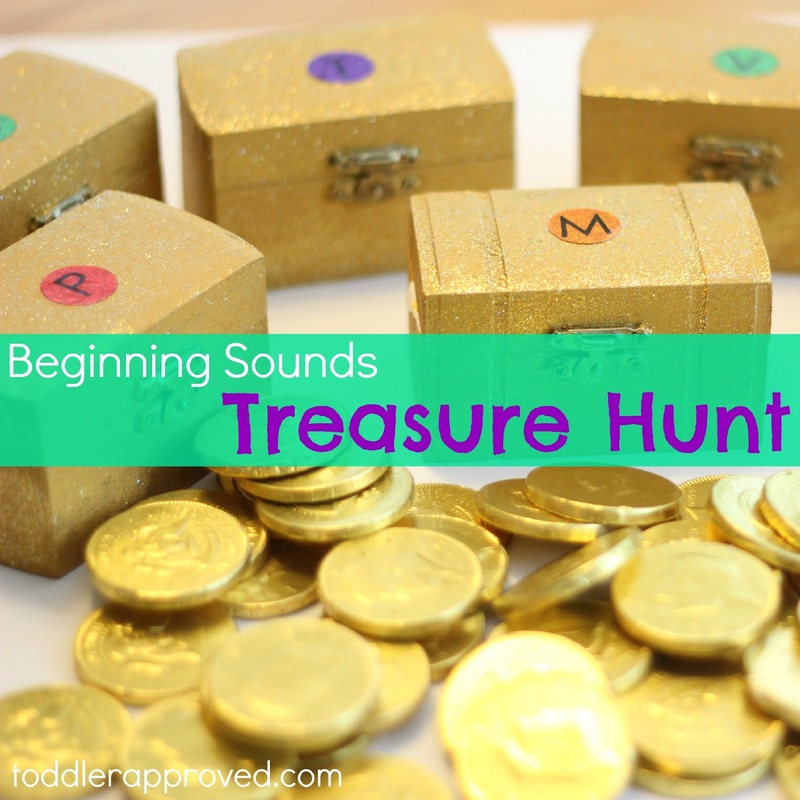 Our first activity used treasure boxes and gold coins and helped us practice beginning sounds (sounds at the beginning of words). Before we could get started though, my son had to get some of his pirate gear on. treasure boxes (we had about 15 in my party stash... you could find these for cheap online or just use a few little kid shoeboxes (spray painted if you are really ambitious)? Decide which alphabet sounds/letters you want to focus on (more than six was too overwhelming for my son). We worked on m, p, v, t, s, and b. Stick the different alphabet stickers on each treasure box. Brainstorms words that start with each letter and write them on the gold coins with a Sharpie. If my son had a hard time coming up with a word I would give him a hint or we would walk around the house and look for objects that started with the different sounds to help us. Hunt for the gold coins. Read the word on each coin (or just read the name of the beginning letter) and figure out the sound that the word starts with. My son knew several of his favorite words by sight and then for other words he didn't remember, I would read them to him. Put the coin in the correct box that matches the beginning sound. For example, ten starts with the /t/ sound, so it went in the T box. Continue until all of the coins are in their correct box. Hide the treasure boxes (filled with coins) all around your house and then hunt for them! Once the boxes are found, take the coins out, read the words on each coin, and then play again! In my son's case (since we had chocolate coins), once he found the treasure boxes he got to tell me the beginning letters and sounds (and the word if he knew it) and then he got to eat some chocolate coins! He has been hoarding his beginning sounds treasure all weekend and loves hiding the boxes all over his bedroom! Learning about beginning sounds is an important part of getting ready to read! Engaging with letters in fun and interesting ways is a wonderful way to help children make connections and learn quickly. As we did this activity I reminded my son to look at the beginning of the word and I demonstrated what that meant by pointing to the first letter on the left. We have done a lot of beginning sounds activities, so he didn't need very many reminders. I had him point to the beginning letter a few times while he said the letter and sound. These simple skills are actually really important for beginning readers. 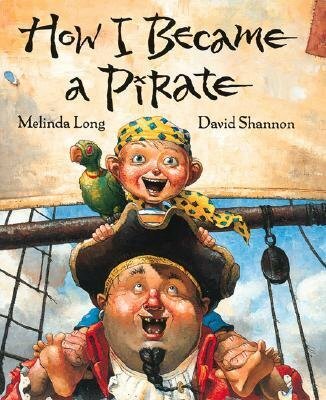 Another fun activity to go along with this treasure hunt is to go on a beginning sounds hunt as you read How I Became a Pirate by Melinda Long. If you haven't read this book yet, it would be a great one to read this week as part of Children's Book Week. Read the book together and occasionally stop and point to words that your child has heard or seen before. Ask them to tell you what sound the word starts with! If your child already knows beginning sounds well, you could even ask them to identify the middle or ending sounds in the word. Do you have any other favorite pirate themed learning activities you've tried? Have you done any Children's Book related crafts or activities lately? We've love you to come link them up to the Children's Book Week Linky below if you are interested in sharing! I would love to add your ideas to my Children's Book Related Crafts and Activities Pinterest board too! Such a fun learning game—it would be fun for a pirate themed toddler's birthday or a playgroup too! AND...CONGRATULATIONS on the little one on the way!!!!!!!!! !